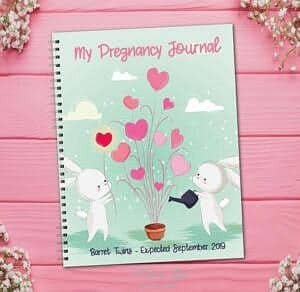 There are several different types of journals to choose from when looking for a twin pregnancy journal book. 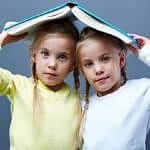 This list will help you get an overview of the different types of twin pregnancy journals to choose from. Some give you the opportunity of customization, so you can choose color, image, personal messages and add extra pages. This twin pregnancy journal book is 8.5 x 11 inches and has gender neutral colors of yellow, peach and mint. You have a choice of wire color, you can order in silver or white. The cover is thick cardstock topped with a clear laminate page. You can customize the pregnancy journal entering your babies names and due month for the journal cover. Other customization options are possible if you contact the seller, and let her know what you’d like. You can order the book with a baby whale or baby owl theme as well. This twin pregnancy journal book is 8.5 x 11 inches and has gender neutral colors of yellow, peach and mint. You have a choice of wire color, you can order in silver or white. The cover is thick cardstock topped with a clear laminate page. You can customize the pregnancy journal entering your babies names and due month for the journal cover. Other customization options are possible if you contact the seller, and let her know what you’d like. This twin pregnancy journal book comes in several different cover pattens. It has handmade bead & paper charms on the cover. You can choose between eight different designs or have a custom charm designed. You can choose footprints, bonnies, elephants, foxes, giraffes, initial roman or script and twin wales. You can write your own message for the cover. The twin pregnancy journal book consist of 58 pages organized into trimesters and delivery. You can add extra pages for an additional cost. The book is 8.5 x 11 inches. This journal is a week by week planner you can use to document your twin pregnancy. 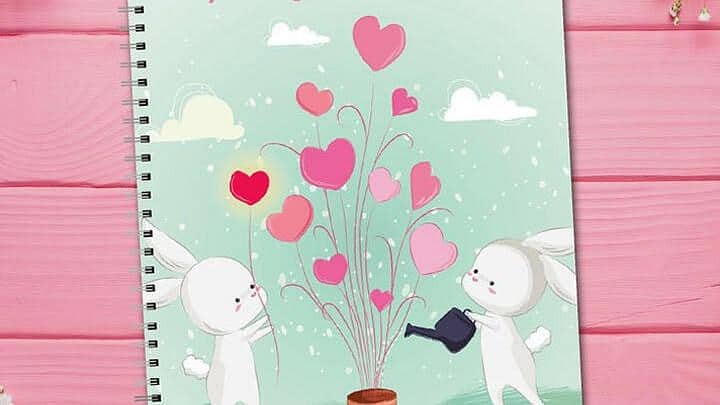 You can note your weekly weight gain, your prenatal test results from your doctor visits, make to-do lists, budget and document your thoughts and feelings. The height of the book is 8.5 inches. 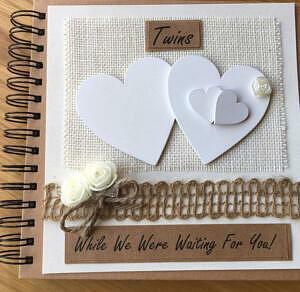 This pregnancy journal for twins is made of printed kraft card, jute twine, cream roses, pearl flower, white wooden hearts, recycled wallpapers, cream hessian and hessian crochet trim. It’s a blank album, perfect for photos and journaling. It’s made from kraft card and is 20cm x 20cm with 40 blank pages. It’s possible to use both sides so you get up to 80 pages in total. This vintage twin pregnancy journal book is printed on a 120# double thick cardstock for the covers and the backers, while the writing pages are on a 70# txt French milled sheet. You can buy it with 25 or 50 lined or unlined sheets. You can customize the cover, and add your own favorite quote if you’d like. The binding is a bronze wire. It’s a blank album, no pages have been filled in beforehand. This twin pregnancy journal book is for the soon-to-be mom who’d like to do all of the work herself. It’s a very basic journal. No pages have been filled in beforehand. It has 100 blank lined pages with an area to record the date. The cover of the book is matte. It is 6 x 9 inches. 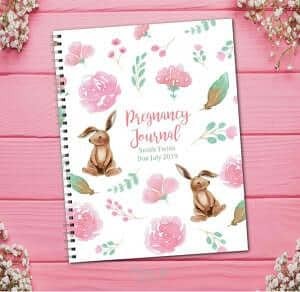 Why do you need a twin pregnancy journal book? You think you’ll never forget when you first felt your babies kick, and how you felt during your first, second and third trimester. However, as the years go by, certain milestones can become tricky to remember. 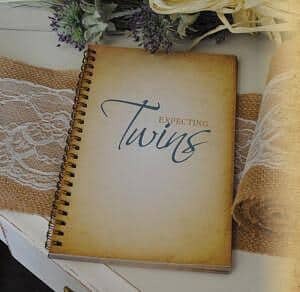 Using a twin pregnancy journal book will help you record those special moments and milestones of your twin pregnancy. In some twin pregnancy journal books you’ll be able to choose your own design or pattern. Others let you add additional pages or whatever cover message you prefer. 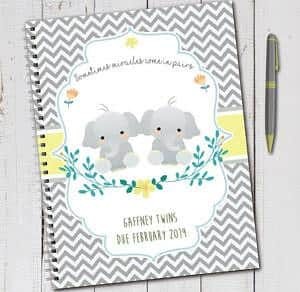 In most twin pregnancy journal books, you’ll find sections about doctor visits, ultrasound & twin baby bump photos, checklists, birth plan, gender reveal, baby shower, gifts received, birth details and more.